Fried, on the half shell, of the Rockefeller variety—however you like your oysters, you’re going to find a delectable option in Massachusetts. From upscale destinations in Boston’s North End to cozy bars in Salem, there’s a whole world of delicious oysters awaiting you in the Bay State. Here are the 10 best places to get ‘em. Start with oysters on the half shell, and then try grilled oysters or Oysters Rockefeller. Move on to an entrée of delicious fried oysters. You’ll find all this and more at Union Oyster House in Boston. The restaurant’s history combined with the cuisine makes for a memorable dinner. Enjoy oysters on the half shell, oyster shooters, Oysters Rockefeller and more at Sea Level Oyster Bar. 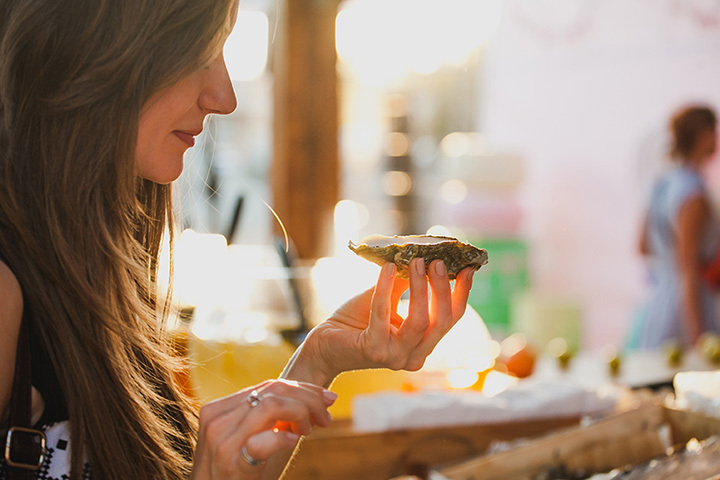 Enjoy your raw oysters as part of a raw appetizer medley—choose from Hook, Line or Sinker. Treat yourself to Sashimi Oysters, oysters on the half shell, Oysters Rockefeller and more at the Oyster Company. You can’t visit Cape Cod without indulging in fresh seafood, and this is the perfect place. Marliave is a well-known French restaurant that features daily oyster specials. Make a reservation and dress the part, but be sure to check this place out if you want to experience oysters a la France. The Naked Oyster farms its own oysters, and the freshness shines through in their delectable oyster stew. The raw oysters are a delicacy, too. Between the two, you’ve made a meal, but order an entrée just the same—or at least dessert! Enjoy your oysters as an appetizer or an entrée at B & G Oysters. The fried oysters are light and crisp, and served with tempting sides. The oysters on the half shell at the Wicked Oyster are Wellfleet Oysters. It’s hard to get oysters much fresher than that! You’ll love the atmosphere and cocktails, too. Fried oysters with fingerling potato salad are considered an appetizer at the Hourly Oyster House, but customers often enjoy it as a small plate instead. The Old Bay aioli is a delicious touch. The oyster platter at Jake’s Seafood features lightly breaded plump oysters and sides. Jake’s Seafood is serious about BIG flavor. Out-of-towners visit to have one every summer. The raw bar at the Impudent Oyster is excellent, with the oysters taking the cake. Order up a half dozen with cocktails and whet your appetite for an amazing dinner.